So this morning our class started late so Valerie and I walked the five miles uphill to class just to get some good old exercise in. Also I found this super cute vest on Pinterset (where else???) 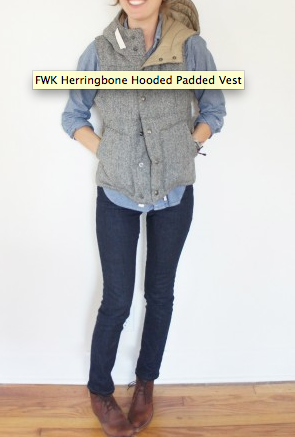 It is perfect it has pockets, and it is herringbone and it has a hood. But you know what the one main problem is it is $460. Say what!!!!! Why would it cost that much that makes no sense. I mean I understand nice and expensive clothes. But it is a vest. It doesn't even have sleeves, it really only keeps you half warm. It is like half a jacket therefore it should cost much less than a jacket not more.